I guess I should begin with a small apology. I took an unscheduled break from blogging and in the process I guess I worried some of you. I really am sorry. I'm fine...all is well...no need to worry! I can't believe I missed the entire month of May from blogging. I never intended to take a break. It just sort of happened without my knowledge. Really. I've been so busy, busy, busy, it's almost been to the point of ridiculousness. Now I want to say....thank you! Thank you for your emails inquiring about my whereabouts and if everything was ok. It's nice to know that I was missed and that I was in your thoughts. How about I share my Summer mantel with you? I wanted to go with something a little fun & whimsical this year. And for once, I didn't care about trying to match the colors to the living room couch or the area rug. I just did what I wanted to do and enjoyed myself doing it. Ha! No rules! I didn't buy anything for this mantel display. I had everything on hand...except for the baseballs. Those were courtesy of my husband. I promised to return them to him after Summer was over. Scouts honor. Sorry about the reflection in the mirror. You all know how much I hate the ceiling fan. But the pictures on the opposite wall are quite visible in the reflection too. Oh well. I just love that big jar of baseballs! We are big fans of baseball in this house. There is always a game being played or being watched on TV around here. Would you believe I bought that jar for $5.00 at a tent sale? I think it was a steal! The left side of the mantel. I bought the sailboat last year at Michaels. I whipped together the banner for some fun color. Thank you for stopping by for a visit today. I'm hoping to return to blogging more regularly now. I don't know that I'll ever be able to catch up on all that I've missed with all of you, but I will be over to visit you soon. Oh- Gina- I was gone so didn't realize YOU were gone, too, because I didn't have a computer. I was thinking about you this morning and wondering why I didn't see a post from you now that I have been back a few days. Some of my blogs I read dropped off for some reason so I thought I would have to come hunt you up----but here you are! 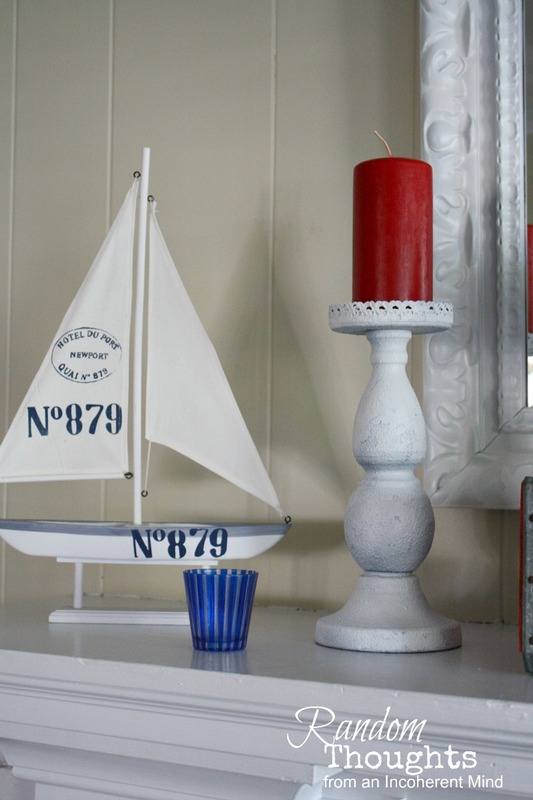 Oh Gina, your mantles and vignettes are always so cute and inspirational!! 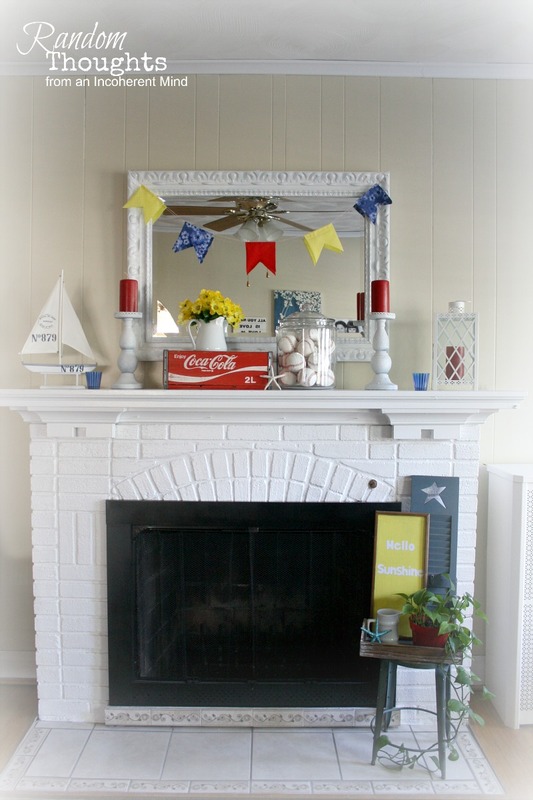 This mantle is just adorable and FREE!! Woo hoo!!! Also, I looked at your coffee cake muffins (I love Cook's Country!) and I'm with you. I have such joy in baking things just for the pleasure of doing it! Welcome back, Gina! Your mantel is fabulous! I love the jar of baseballs! 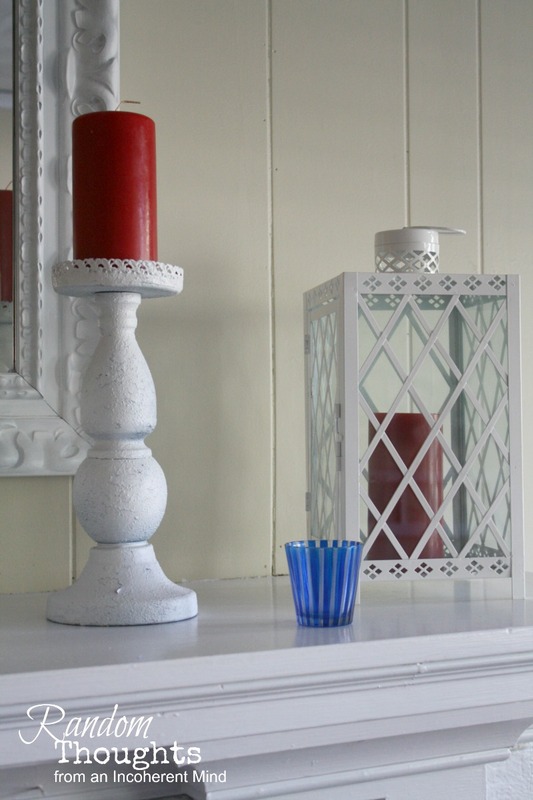 You always have the best vignettes! This mantel definitely makes me think of summer fun! Hey Gina!!! I thought about you just the other day. I posted only once during May. It's a busy time of year for us too. Now, about your mantel, I love it! We are Coke fans, that would be one item of decor my crowd would understand and approve haha! The color scheme is perfect for summer. I am loving the reds at the moment. Glad you're back! Hi Gina! I was wondering where you were! So good to have a comment from you on my blog too! I love the jar of baseballs as well! Cute idea! Take care my friend! Sure take a break then come back and do a mantel all cute with coke crates and baseballs and show us all up! Hi Gina, I did miss your posts. Love the baseball filled containers. 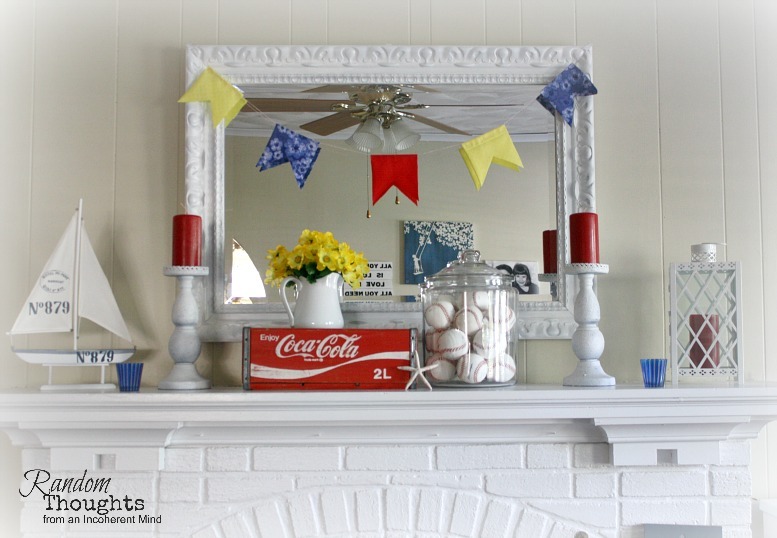 Yes we are big baseball fans too as my son's team won the state finals back in Pa. Love the mantel and the summery feel. Great idea! Welcome back! 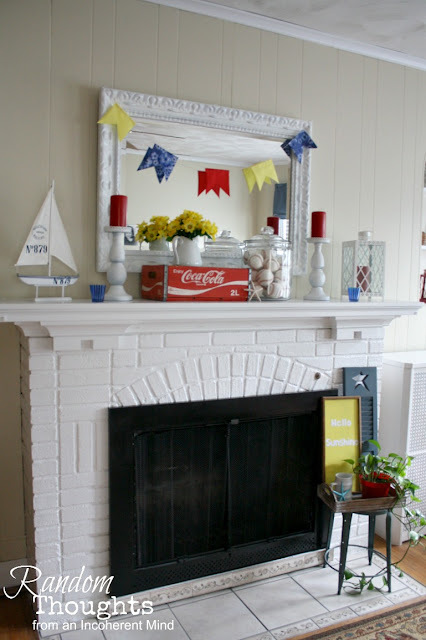 I love the mantel...especially the coke crate. I remember how busy May was when my kids were home. Glad you survived! You did a great summertime job - it is just so fun and festive! Glad you're back, but you knew that already. Hugs. Cute as always Gina!! It is good to take a break once in awhile... but glad to see you back. I know how time flies when you are busy. I just went searching to see if I missed some posts. Welcome back! ahhh, so glad to hear from you, Gina girl. Hi Gina! So good to see you back and to hear that all is okay...just busy. We're in the middle of a really busy time too. We've had at least one baseball game everyday for the last 5 days! I love your jar of baseballs. I should do the same thing. It seems like it is our lives right now. Not sure that I'm really excited about that ;-) Anyway, I really like your mantel. It is what summer should be all about fun and whimsy! Great job! Have a wonderful week! :D I absolutely love this! It's All American and AH-dorable! So happy you're back to blogging. I've missed you, and yes, I was worried! But I know what this time of year is like with school and with kids. I think this might be my favorite mantel so far! I like it -- colorful and fun! Such a happy and fun inducing look. So glad to know you're been busy... and happy. So good to have you back for this lovely setting. Even a die-hard Summer non-fan has difficulty to stick to it in the face of this. Happy Summer, Gina! Have lots of fun!!! This is awesome Gina. I love red white and blue. Those three colors grab attention, and the baseballs in the jar are too fun. Girlfriend, I have no idea how you do all that you do and work....Yes, you should be a crazy lady. Your mantle is just plain fun! Hi Gina! I have missed you and glad you're back! Oh, your mantel is so cute - summer all the way! You always amaze me with your decorating talents! I've been so busy I haven't had time to decorate for summer. I'm hoping that at the end of the month things will start to get back to normal...I'm afraid I too have been away from Blogland too long but like I said, hopefully soon. Anyhoo, like always, your mantel turned out awesome. Just by looking at it you know it's all about the fun days of summer. Love it. Glad you are doing well and that you've just been busy. Love your summer mantel - great colors! 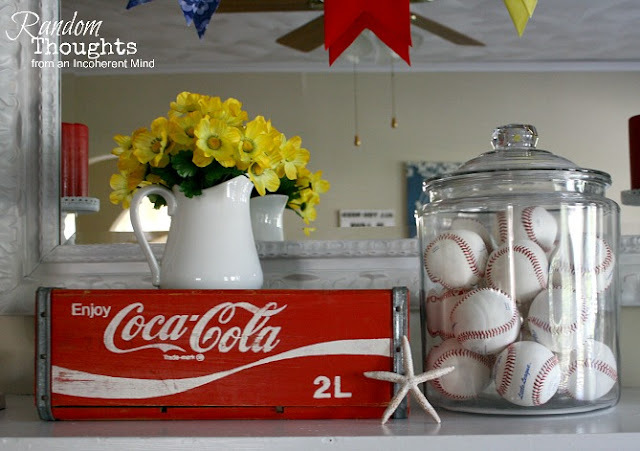 How clever to fill that glass jar with baseballs, too. 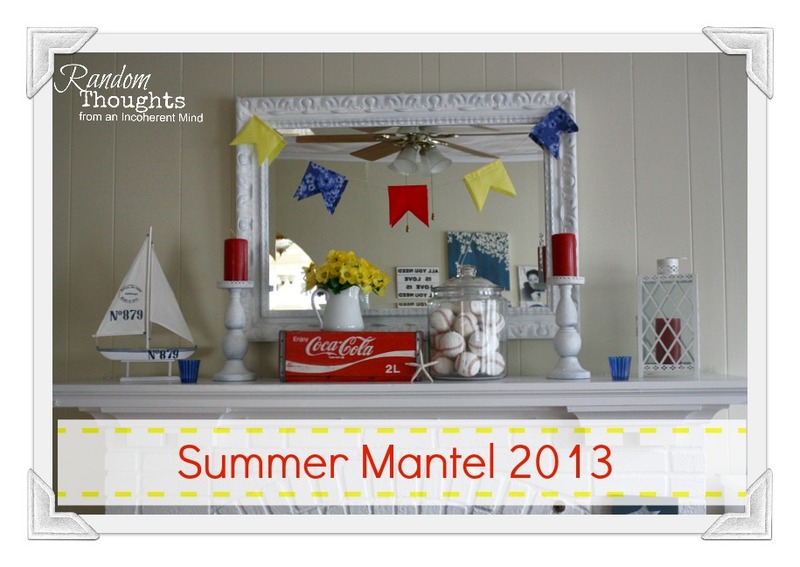 Gina - That is such a cute, carefree, summery mantel! You did a great job. Love the jar of baseballs. This is my favorite one yet!!!! I absolutely love it! this is brilliant! the colors... the coca-cola, the baseballs... you always amaze me! 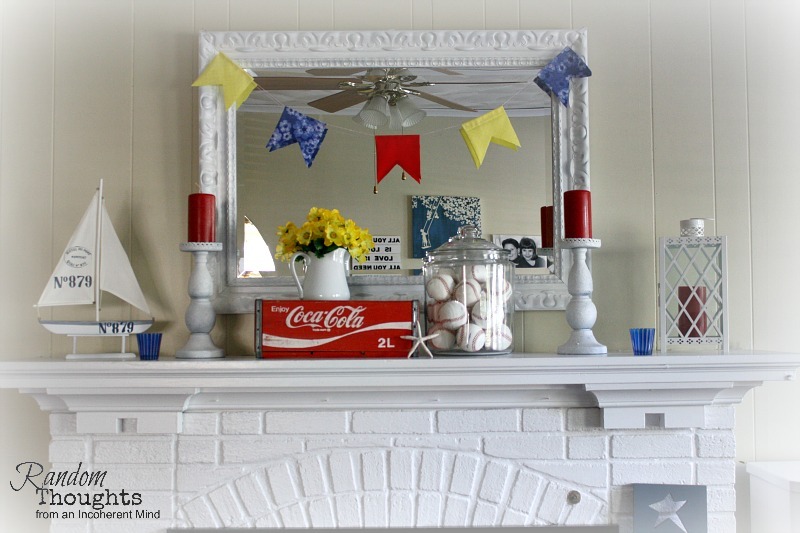 What a creative mantle! It's nice to hear from you, Gina. I've been "hit and miss" with my blog for a while, too, so I understand! Your summer mantle is fresh and pretty and I love all the things you've added to make it that way. The first thought I had when I saw your delightful summer mantel was that it looked like an All American mantel with the colors, baseballs, and coke crate. Hi Gina, I've been scarce on the blog too. I'm glad you're A okay. Your mantle is magazine gorgeous. It's so original and beautifully done. I just love it! This is an All-Time FAV for me!!! Gosh, you are soooo inspiring! !